Hike along the dramatic coastlines of Spain and France. Visit and stay in stunning seaside villages like Cadaques in Spain and Colliure in France. Experience cultural highlights like visiting Salvador Dali’s eccentric house, one of the most important monasteries in all of Spain, and a castle in France. You’ll hike along the coast with spectacular views, secluded coves with hidden beaches and picturesque fishing towns. The area was popular with famous artists like Picasso, Dali and Matisse. You can even visit Dali’s house en route while hiking. Despite the beauty of the area, once you’re out of the villages you’ll see few other hikers. You’ll experience a unique mix of solitude with dramatic windswept seaside cliffs. You’ll arrive at mid-afternoon each day to a fishing village and will have time to relax or explore. You’ll definitely want to reward yourself with the freshly caught fish of the day. Besides the dramatic landscapes along the coastal paths, there are also cultural highlights to experience. 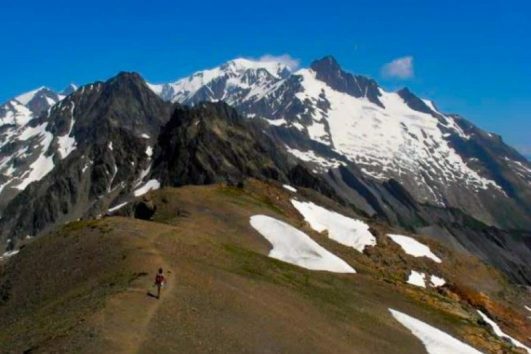 This self-guided tour gives you the freedom to hike on your own, at your own pace, stopping as little or as much as you like. We’ll provide you with a map, detailed instructions and an easy to use GPS pre-programmed with your route. That way you can easily see if you’re on the right track. Don’t worry, your tour includes an in-person briefing so we’ll show you how to use it. We take care of the route planning and have chosen the most scenic coastal paths, the time-consuming hassles of booking accommodation in two different languages We do the heavy lifting. You focus on having an incredible hiking vacation. You work hard and you deserve this! 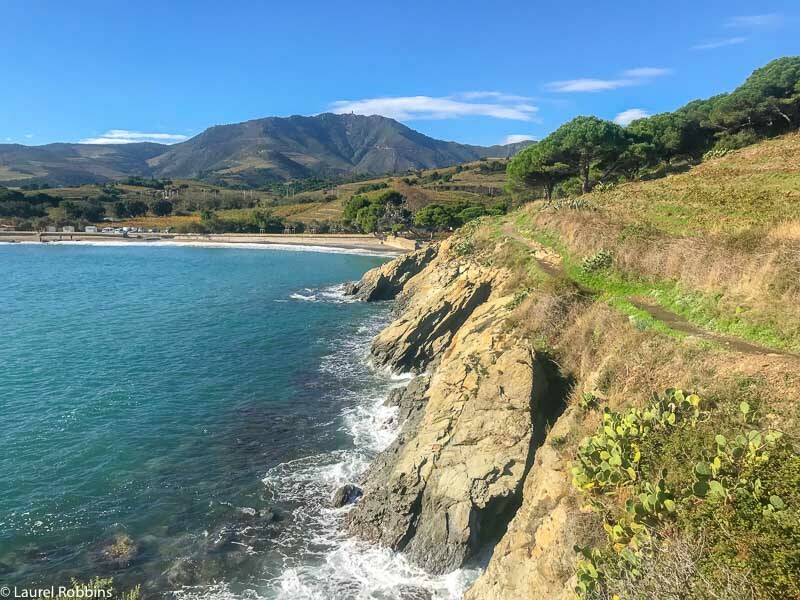 IS THE SELF-GUIDED COASTAL PATHS OF SPAIN AND FRANCE RIGHT FOR ME? Enjoy being in nature, without being in it 24/7. You love being outdoors, but you also want to pamper yourself. Experience both hiking and culture. This tour offers plenty of both. Travel in both Spain and France. You get to see both from a unique perspective on this tour. Discover hidden coves and beaches. You may even have one (or more) all to yourself! Go to places your friends have never heard of, like Cadaques. Barcelona is the closest airport so you combine it with places on your bucket list. Challenge yourself physically but also have time and energy to explore on your own. Recharge in nature. Being by the Mediterranean Sea will do you wonders. Feel happier. Hiking gives everyone a natural hiker’s high. Connect with a loved one. Hiking is a great way to create lifetime memories with someone. Eat delicious Spanish and French food. If you love fish and seafood, you’re in for a real treat! You see the booking terms and conditions by clicking here. Want to speak with us? Click here to schedule a call with us. You’ll be picked at Girona airport/train station or Figueres train station (your choice) and transferred to your hotel in Cadaqués, Spain. Your guide will give you an orientation, the pre-programmed GPS device, along with a demonstration of how to use it, your itinerary with step-by-step instructions, hotel information and tourist information of what else you can see and do in the area. After your orientation, you’re free to explore on your own. We recommend taking a walk to explore this gorgeous seaside village. Today you’ll embark on a beautiful walk which takes you right by Salvador Dali’s house. It’s located right on the coast and near the start of your hike. It’s available by a guided tour only and takes ~ 30 minutes. 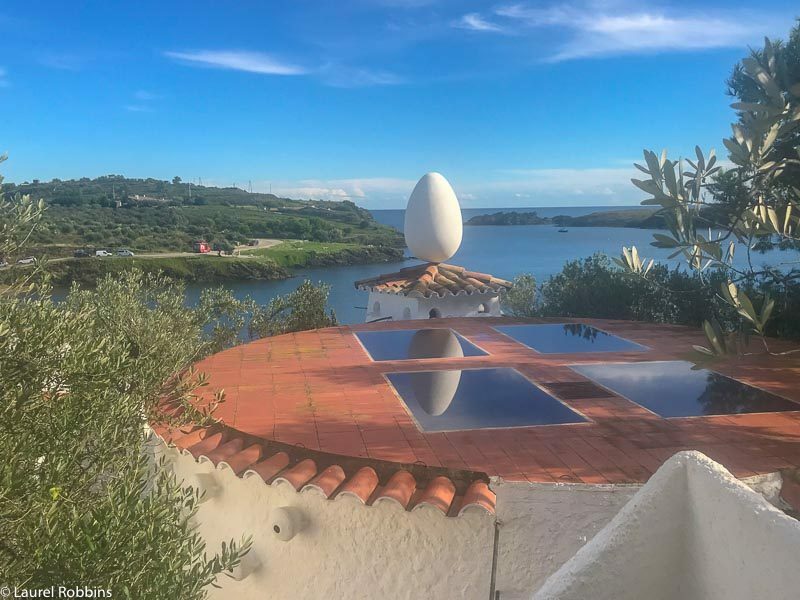 After visiting Dali’s eccentric house, you’ll make your way to the Cap de Creus the most easterly point of mainland Spain. Here you’ll get some spectacular coastal views. The rock outcrops are one of the most significant features of the natural park. You may find yourself getting carried away by your imagination. Visitors often report seeing images of real or mythical animals in the area (lions, dragons, camels, eagles, cats, rats…).You can then make your way back or call a taxi to take you back to Cadaques. Distance: 16km (can be shortened to 8km if you choose to call a taxi from Cap de Creus). Leaving Cadaqués behind you’ll make our way north through the heart of the famous Cap de Creus Natural Park. You’ll follow a rural trail with beautiful views of the Catalan countryside. You’ll get some magnificent views of the Pyrenees and the French/Spanish border before arriving in El Port de la Selva. From El Port de la Selva you’ll hike up a small mountain to the Sant Pere de Rodes Cloister, one of the most important Monasteries in Spain. It dates back to the first century after Christ. After your (optional) visit, where there’s also a restaurant (pricy but incredible views), you’ll make your way up to the ruins of Castle of Sant Salvador. From here you’ll have a breathtaking view of the Alt Emporda County, across to the Albera Mountains and far into the Pyrenees. You’ll also have stunning views over the Bay of Roses and the entire Cap de Creus. You’ll then make down to the seaside town of Llançà. In the morning, you’ll take a private transfer that’s included in your tour from Llançà to Portbou (skipping the least scenic part of the Catalan Coast in our opinion). From here you’ll start hiking again. 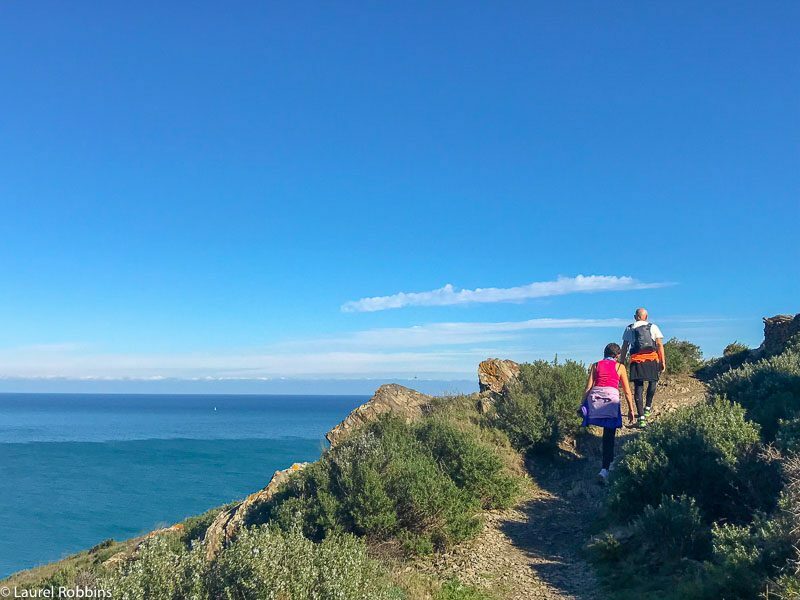 You’ll get wonderful views over the Pyrenees, the famous Canigou Peak, one last look at the Cap Creu and of course the Mediterranean Sea as you ascend up the beautiful Catalan Hills. At the border of Spain and France, approximately a 30-minute hike from Portbou, you’ll have the opportunity to visit the Exile Memorial. It’s a tribute to the 500,000 refugees who made their way here in 1939 fleeing Franco’s regime. After that, you’ll cross the border into France and onwards until you reach the French seaside town of Banyuls-sur-Mer. You’ll hike along quiet lanes and cliff-top paths around the rugged Cap Béar headland,. The views are truly spectacular. There are a couple of spots where you can go for a swim before winding your way through the vineyards that produce the region’s wines. You’ll reach the end of your breathtaking journey, in the beautiful French coastal town of Collioure. Of special note here is the Château Royal de Collioure, a massive royal castle. Departure day. You can either make your own way back to Barcelona by train, let us arrange a private transfer from Colliure back to Barcelona (€325 for 1-4 people) or continue on further into France. Entrance to museums, castles or any other cultural activity. Transfer from Colliure to Barcelona, and transfer from Barcelona to Girona. Note: All times, distances and elevations are approximate. This trip is available from March 1st to October 31st. It’s possible to go in July and August but we don’t recommend it because of the heat. It’s also high season so the accommodations are more expensive. Book as soon as possible to ensure that accommodation is available on your start date. This is especially true if you’re doing your tour in June or September when accommodations fill up quickly. €995 per person based on double accommodation for three nights in 3 -star hotels and three nights 4-star hotels from March to May 31st and October. For June and September, it’s an additional €179 per person. For solo travellers a single supplement of €375 applies. The transport of belongings each day. Pre-programmed GPS you can use to ensure that you’re going the right way. We’ll transport your luggage each day to your next accommodation. You only need to carry your day backpack with whatever you need for the day. We also recommend bringing a packed lunch with you each day. Grade 2 (medium). The elevation is very hilly. You’ll hike uphill then downhill, only to go uphill again as you follow the coastal path. Don’t think that because it’s a coastal path, it’s easy. While it’s not difficult hiking, it’s more difficult than many people would expect for a coastal path. An average day’s walk is between 12 to 17 km. This hike is a self-guided tour. You get the flexibility and freedom of starting your day when you choose. You hike at your own pace and take breaks whenever your heart (or lungs) desire. Or you simply want to enjoy the scenery or go for a dip in the Mediterranean Sea. We’ll take care of booking your accommodation, provide you with a pre-programed GPS so you won’t get lost and instructions in English. We’re there for you prior to and during your trip. Ask all the questions you want. Our goal is to make this the easiest vacation that you’ve ever planned. Your tour starts in the fishing village of Cadaques, Spain. Your tour includes a transfer from Girona to Cadaques. It takes 38 minutes to 1 1/2 hours by train to get from Barcelona to Girona. Girona is beautiful If hotel will be located in Levanto. You’ll either hike directly from here or take a train to the starting point each day. You’ll have the option to return by train, and sometimes by boat (depending on the day and weather permitting) to the same hotel each day. You’ll be provided with a packing list of what to bring. It’s highly recommended that you have travel insurance that covers you for this tour. Be sure that your travel insurance includes emergency evacuation and hospital care in the unlikely incident that you get injured. We recommend World Nomads insurance. You should be in good physical condition and be a regular walker or hiker. The route is not technical so no prior expertise is required. 20% of payment is due at the time of booking. As soon as we receive your deposit, we will start making the arrangements for your accommodation. The remaining balance is due 45 days before the onset of the trip. If you’re booking within 45 days full payment is due at the time of booking. The distances and ascents/descents are approximations as are the hiking times, which don’t include breaks. The itineraries shown may change slightly if hiking trails are closed. Transport from Barcelona to Girona. From Girona, we’ll pick you up and transfer you to Cadaques. Transport from Colliure, France back to Barcelona (or your onward destination) . Admission to any museums, castles, monasteries or other cultural activities. Travel insurance is highly recommended and not included. The closest airport is Barcelona. We recommend searching on Skyscanner to find the best deals. Note: We highly recommend waiting to book your flights or making other travel arrangements until you receive an email from us notifying you that all your accommodations have been confirmed. The easiest way to get from Barcelona to Girona. It takes between 38 minutes to 1:30 hours depending on the train that you take. We’ll pick you up in Girona at eithe the train station or the airport. From Colliure, the train back to Barcelona takes between 2:40 to 5 hours depending on the train. We can also arrange a private taxi at a cost of €325 (1 – 4 people). The drive takes ~ 2:15 hours. Example of one of the accommodations that we frequently use on this tour. You’ll spend 3 nights in 4-star hotels and 3 nights in 3-star hotels. They will either have a restaurant on site and/or be conveniently located close to restaurants. All your accommodations will be within walking distance to the beach. Laurel, the founder of Monkeys and Mountains Adventure Travel has travelled to Catalonia over 15 times and done numerous hikes and bike rides in the region. She most recently returned in late 2018 to test out this self-guided coastal hiking tour. It’s quickly become one of her favourites because of the almost constant sea views interspersed with cultural highlights, including a visit to one of the most important monasteries in all of Spain. And the food – SOOOO good! There can be a lot of anxiety when booking a hike; Am I making the best use of my limited vacation time? Am I fit enough to do it? How do I figure out all the logistics? How do I get there? Will my partner also enjoy this? Our goal is to make your Coastal Hike from Spain to France the easiest you’ve ever planned. Unlimited email support. Ask all the questions you need to. Pre-programmed GPS so you’ll know that you’re on the right track.